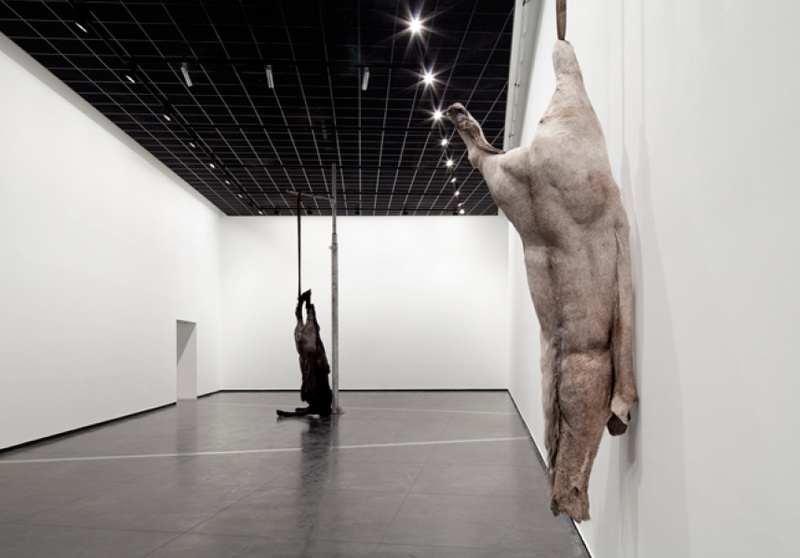 Celebrated Belgian artist Berlinde De Bruyckere uses horse skin, wax and hair to create haunting sculptures of animals, humans, intestinal tracts and trees in We are all Flesh, her new exhibition at ACCA. Romeo "my deer" I, III, IV and V.
We are All Flesh, 2010-2012. It’s like a tomb in here. 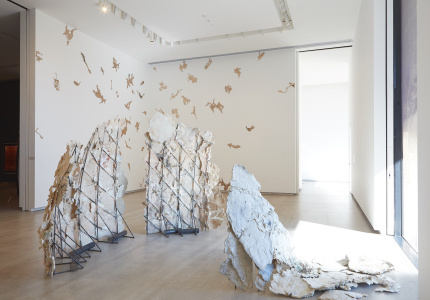 Wandering the main space at the Australian Centre for Contemporary Art, the two title works of We are all Flesh dangle, slung and suspended, as if immense monuments to the flesh. They are vast equine corpses, stripped of faces, hooves and features; they drape mutely and obliquely from aging steel armatures. 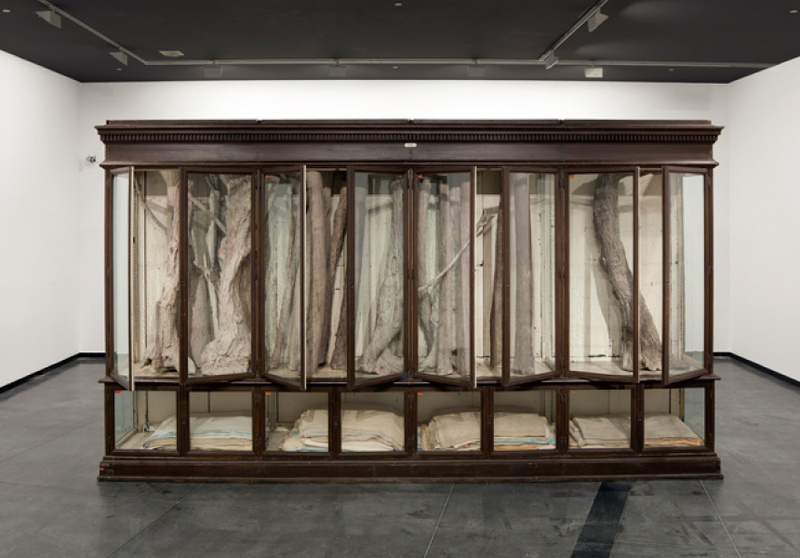 In an adjoining space, clusters of tree trunks and branches rendered in wax prop vertically within an imposing antique cabinet reclaimed from a natural history museum. They are displayed as if bones. 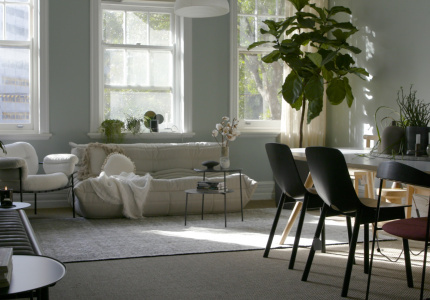 Piles of faded, fraying woollen blankets fill the shelves beneath. 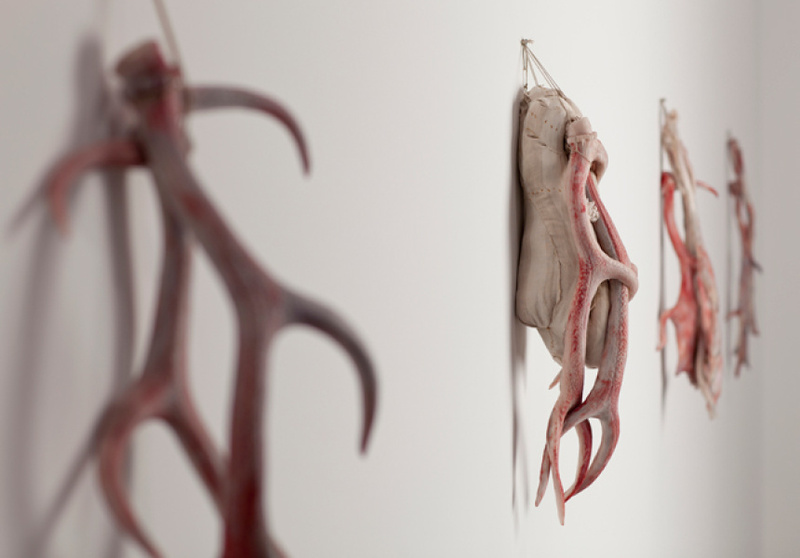 In another space, fleshy wax antlers – twisted and bound – punctuate one wall as if trophies, while a pallid human form entwines a soft, quilt-like bulge. Wax twigs and intestines rest, bundled, in an odd sling-like structure. An immediate reaction to the work of Belgian artist Berlinde De Bruyckere is one of deep, deep melancholy. Her sculptures – constructed from horse skin, wax, wool, hair and wood – seem as though works of mourning and decay. But there is more at play here. Although formal qualities of these works – the curve and contour of the body, the bone or the branch – possess an elegiac cadence, this isn't all doom and gloom. We are all Flesh speaks of other states and behaviours. Indeed, the horse sculptures in the main space are far more complex than first impressions suggest. The largest of the works – which hangs from a towering light pole, originally from De Bruyckere’s hometown of Ghent in Belgium – is in fact constructed from two beasts fused together at the belly. One horse’s hind legs splay out on the floor, as if an attempt to bear weight or to aid. These are two bodies attempting to work as one; there is a sense of support and protection here. While the body and the flesh are fragile, they can also be incredibly resilient. De Bruyckere has often spoken of her works in terms of metamorphoses, as distinct from mutation. It’s an important inference. Indeed, while the artist’s longstanding fascination with the gothic inflections of 14th century Flemish art is apparent in her work’s haunting, primeval forms, these bodily gestures also exude a sense of transcendence. By rendering the body, the antler, the intestine, the branch and the twig in the same pink, flesh-like wax palette, De Bruyckere extends a bridge between species and objects and states. It’s poignant and empathetic in the extreme. In the end, we are not so different. We are all living beings of some kind. 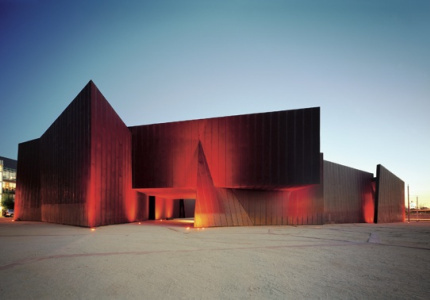 We are all Flesh shows at the Australian Centre for Contemporary Art until July 29.